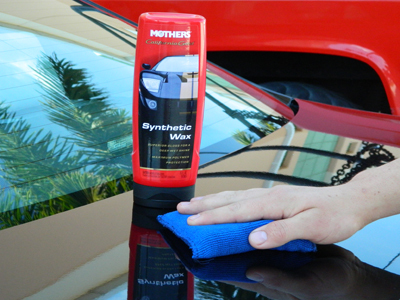 Polish and protect your paint with Mothers polymer-powered wax! Mothers California Gold Synthetic Wax provides unparalleled depth, shine and protection in an easy-to-apply, effortless-to-remove formula. Mother's specially formulated microencapsulated polymers form a chemical bond to protect your paint’s surface, while ultra-fine polishes bring out the gloss and luster you’ve come to expect from Mothers. Mothers California Gold Synthetic Wax can be applied by hand or machine. Mothers California Gold Synthetic Wax is a last step product for anyone who wants quick, spectacular results. Mild polishing agents are built in so, in many cases, there is no need to pre-polish the paint. In one step, you can improve the paint gloss and seal in the shine. It's so simple! Mothers California Gold Synthetic Wax is different from California Gold Sealer & Glaze in that it does not have the glazing properties. Synthetic Wax is a totally unique formula designed to give like-new or newly reconditioned paints the ultimate gloss and protection. And since Synthetic Wax is all engineered, it lasts and lasts. If you wish to layer waxes, always lay down a coat of Mothers California Gold Synthetic Wax first. Then apply a carnauba wax on top of it. Give your vehicle a shine that only scientists could dream up with Mothers California Gold Synthetic Wax! I have been using this synthetic wax for a few years now. GREAT product. Goes on easy, wipes right off. Fantastic shine that lasts six months or more. The easiest wax to apply, hands down. ProsEasy on, wipes right off. Price is great. Forget that carnuba junk! This is one of my favorite waxes. It goes on quickly, buffs off easily and gives great results. Better than average longevity makes this one a no brainer, especially at the price point. Mothers Synthetic Wax is the BEST! I tried many different brands through the years and would say Mothers Synthetic Wax is above them all! ProsEasy to apply. Very economical and effective. Stays longer that other brands. Two applications during a year are quite adequate. Great Wax, Super Fast Service.. Thanks again. You save me a trip to the store.